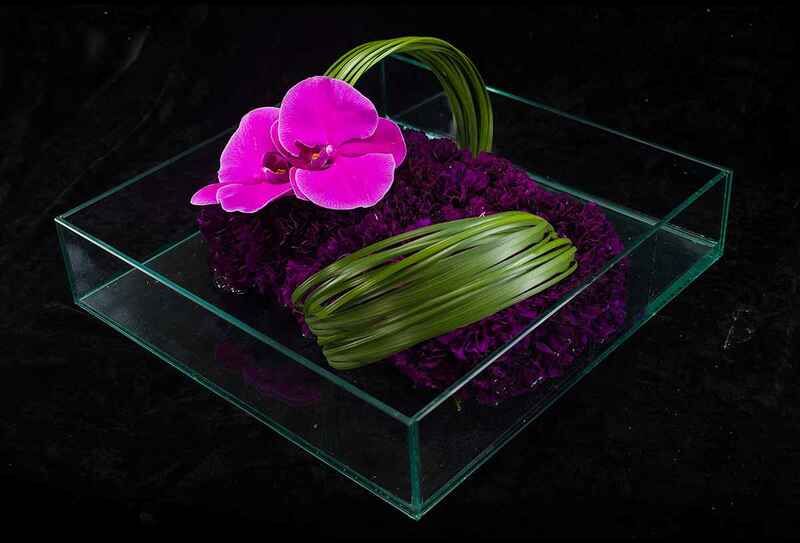 A unique and stylish sculptural arrangement of deep purple carnations with accents of grass and Phalaenopsis orchids in a modern plate glass vase. A flower shop becomes known for being a top floral designer by creating unique arrangements that have a “wow” factor. In this arrangement, we use a deep-purple bed of delightful carnations to serve as a darker base color for the brilliant lighter purple-pink shade of Phalaenopsis orchids placed with perfect symmetry. Loops of deep green colored grass tie it all together, giving the arrangement a feeling of dynamic energy. There are plenty of flower shops that offer run-of-the-mill arrangements that are not that special. With us, you find a flower shop that has the designs you like, which are contemporary and will get you many compliments from your guests. Most of our clients are referred by other clients so we aim to make your guests say “wow that is an amazing floral arrangement!”. Wedding planners choosing wedding flowers love these shades of pink, deep purple, and forest green in a clear rectangular vase. When this arrangement is the centrepiece of a table covered with a brilliant white tablecloth, the effect is breath-taking. It is like having a piece of artwork placed in the centre of the table. This color palette goes along well when the bride wears a white wedding dress. To buy carnations in NYC, one of our clients says, “This is the best flower shop near me NYC has to offer.” When you buy carnations in NYC that are this delicate, you need to count on the best flower delivery service. This is to make sure they arrive in perfect condition and get to the event on time. We make sure everything goes well and according to plans. Make your next event memorable and order our flowers today!